Speak to Enthir at The Frozen Hearth or Hall of Attainment. Speak to Calcelmo in Understone Keep. Copy the Falmer Translation Guide. Bring the copy of the Guide to Enthir. Speak to Karliah in The Frozen Hearth. First go speak with Enthir at The Frozen Hearth in Winterhold. After speaking with Enthir, you'll be directed to the wizard, Calcelmo, at Understone Keep in Markarth. Note: There is a bug that dictates you cannot talk to Enthir if you have started, but not completed the quest The Staff of Magnus, as Enthir believes Winterhold to be in danger and will continually repeat "This is going to be terrible for business." You can go straight to the museum and pick the lock. Using this method causes the guards in the museum to be hostile, and as they are city guards you will incur a bounty if you kill them. You can simply steal his key, which should be right next to him on the table. This option will cause the guards to be hostile, unless you are successfully hidden. If you ask to visit the archaeological site, you will be asked to kill Nimhe (a giant frostbite spider). After you have done this task you will be given the key to the museum, and can walk past the city guards without sneaking. Solving Calcelmo's love problems during The Book of Love will add additional dialog where he will hand over the key to the museum, and allow you passage (the guard at the door will still tell you you can't enter, but the guards in the museum won't bother you). If you can pass a hard Speech check, you can persuade him to give you the key to the museum. But I'm a great admirer of your work. (Persuade) Passed: What kind of a mentor would I be if I denied a potential student a glimpse at his master's ingenuity! Here, this key will provide access to my museum. Feel free to browse for as long as you wish. However, I must insist that my laboratory remains strictly off limits. Whatever you chose to do, it's clear you're going to have to break into Calcelmo's laboratory in order to retrieve the Falmer Translation Guide, so head for the Dwemer Museum. There are a lot of random Dwemer artifacts and books in the museum, but most notably, there is a gate on the south side protecting a room containing an Unusual Gem - the gem is located on a table to your right as you enter the first room on the left. Make your way to the far end of the museum to find the entrance to Calcelmo's Laboratory. As you enter the lab, you can find the Spider Control Rod in the room to the left, which you can use to help clear out the guards ahead (note that the rod only works in the lab). There are two types of guards in the museum and laboratory: Markarth City guards and Calcelmo's personal guards. The city guards here will not be hostile (provided you didn't pick the Museum lock), but Calcelmo's personal guards in the lab will confront you if they spot you, no matter what (though they will not give you a bounty if they are harmed). It's possible to sneak past all the guards in the lab without any combat, but you can also employ the various traps around the lab to dispatch them quickly. Whatever you choose, make your way to the end of the laboratory. As you make your way through, beware the hall with the poison gas; your health will drain rapidly until you reach the other side, and it is not possible to prevent the damage with poison resistances, even with items such as Hevnoraak. Putting 40 pounds of weight (either the body of a dead guard or a heavy item such as Dwarven armor) on the pressure plate at either end of the hall will depress the plate and stop the gas from spreading, allowing you to comfortably loot the corpses. You can also Become Ethereal and not suffer the poison for the duration of the shout (though be warned, this may alert nearby guards). At the end of the lab, you'll find Aicantar's study, where Calcelmo's nephew is busy with his research. Activating the trap here will send Aicantar into a panic and he and his guards will make a run for it (or you can just sneak past him). Near the exit, you can find the Dwemer Puzzle Cube for The Litany of Larceny quest. Exit out onto the Wizard's Balcony and head up the stairs to the right into Calcelmo's Tower. In the tower, follow the hall to the left to find a room with a desk. Beyond the room is the Falmer Translation Guide, which turns out to be a massive stone tablet. There's no way you're bringing the whole thing back to Enthir, so grab a piece of charcoal and paper from the previous room and use them to create a rubbing of the tablet. After you copy the text, two Wizards' Guards, Captain Aquilius, and Aicantar will enter the tower to hunt you down. You may fight them if you wish, but you can also simply sneak past them after they split up. Distracting the remaining guard with an arrow is a good way to aid a stealthy approach. For the quickest escape, look towards the exit from the tablet and you'll notice a small ledge on either side of the wall over the door. Move from behind the tablet onto the platform to your left, then jump onto the little "chimney" at the end of the platform. From there, you can jump onto the small ledge and proceed directly to the door. Once outside, a waypoint will indicate your exit route: simply hug the right wall of the balcony to find a gap leading to a small cliffside path, terminating at a waterfall. Carefully jump into the pool at the base of the waterfall to complete your escape. It's also possible to "climb" down from the balcony by looking left and down when you reach the waterfall - there will be a path of sorts where you can make very small drops to multiple rocks (you can use Become Ethereal) to avoid damage with either method). Alternatively, you can also just retrace your steps back through the museum and exit the keep the same way you came in. Once you've escaped, return to Winterhold, where Karliah and Enthir are waiting in the cellar of the Frozen Hearth. Enthir will use the rubbing of Calcelmo's tablet to translate Gallus' journal, confirming that Mercer used the Guild's funds and desecrated the Twilight Sepulcher, the secret shrine to Nocturnal that the Nightingales are sworn to protect. Karliah will also give you the Nightingale Blade as a token of appreciation, and ask that you to meet her at the Ragged Flagon. After talking with Enthir and Karliah, the quest ends and The Pursuit begins. Note: Completing this quest will lock the backdoor from Riften's graveyard to The Ragged Flagon - Cistern until later in the next quest. The trinket in this quest is the Dwemer Puzzle Cube. It can be found in the Calcelmo's Laboratory zone, in the room where Aicantar is reading. The Cube is on a table to the right, after going past Aicantar's table but before the door to the balcony. Once you've collected the trinket, it can be returned to Delvin Mallory for some leveled gold. The highest level version of the Nightingale Blade is untemperable (levels 46+), making the level 36-45 blade the best version. However, all versions lack a smithing perk, so they will quickly fall behind other swords when you start tempering. If you're immune to poison, the hall with the poison gas will not harm you, even though the coughing sound effects will play. If you kill Aicantar prior to copying the Falmer text, he will not arrive with the guards and the city captain. Instead, there will be one extra guard in his place. Dawnguard reveals at least two NPCs who could conceivably translate the Falmer language, but doesn't add a way to ask them to do so. Despite obtaining the museum key from Calcelmo the legal way, there is no quest log about him letting you into the museum, but only notes how stubborn he is. When you take Gallus's Encoded Journal to Enthir, if you ask about the Falmer he will give you a brief history and then say that he has a book on his table if you are interested in knowing more. As he is found in the inn during this quest, this may be a reference to The Falmer: A Study found on a table in the Frozen Hearth Cellar. It is possible to obtain two copies of the museum key. If you proceed with the bribe/persuade dialogue options, Calcelmo will give you the first key. However, this doesn't disable the dialogue about killing Nimhe which allows you to receive another key upon completion. Picking up the museum key after the quest has finished restarts the quest. The quest item flag on Gallus's Encoded Journal is not cleared on completion of the quest, leaving it permanently stuck in your inventory. Enter the console command player.removeitem CEDA6 1 after completing the quest. Enthir may be stuck saying "This is going to be terrible for business" if the quests The Staff of Magnus or The Eye of Magnus are active. Both of these quests may have to be completed in order to talk to him. Another possible solution is to leave and wait for normal store hours and Enthir becoming open for business. Sometimes leaving the building and reentering will get his correct dialogue running. His dialogue changing to a store (fence) shows his script has been completed and he is out of the picture for this quest. A possible workaround is to sneak into the room with the guard and use a bow to kill him. Even if he is running towards you, it seems if you can kill him before he starts his formal dialogue, the bounty is not added and you can play on as normal. Karliah sometimes returns to Snow Veil Sanctum without giving you the following quest. This seems to have to do with having Mercer's plans in your inventory. This is an important quest item for the next quest and the quest fails to load as long as this item is in inventory. You should drop the plans somewhere, and retrieve them when you want to finish The Pursuit. Use command Startquest TG07 then Set stage TG07 0 to start and add the quest to the journal while keeping Mercer's plan, when they're "quest items" and it doesn't allow you to get rid of them. Calcelmo's stone rubbing appears on the ground in the College of Winterhold after completing this quest. When you pick it up, it's marked as a quest item and you cannot remove it from your inventory. Upon entering the Dwemer museum again, the quest starts again and you have to copy the inscription on the stone again. If you go to Enthir afterwards, you can give him the stone rubbing and receive another Nightingale Blade. ? 10 Karliah believes the only proof that could expose Mercer's treachery can be found within the pages of Gallus's journal which she recovered from Snow Veil Sanctum. Unfortunately, the journal is written in some sort of code that needs to be deciphered. Our only hope is Enthir, one of Karliah and Gallus's former acquaintances who is a wizard at the College of Winterhold. 20 Enthir has informed me that Gallus's Journal is written in Falmer. He's directed me to seek out Calcelmo, the Court Wizard in Markarth who is the foremost authority on them in hopes of obtaining a translation. 30 Calcelmo has proven to be extremely stubborn and refuses to allow me access to his materials regarding the Falmer language. I'm left with little choice other than taking matters into my own hands and stealing his notes. 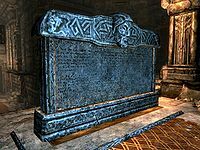 40 Calcelmo's "notes" on the Falmer language are actually derived from a massive stone slab in his tower! It will be impossible to bring this item to Enthir to have him translate Gallus's Journal. I'll have to discover a way to make the information more portable. 200 Finishes quest After Enthir successfully translated Gallus's journal, I've discovered that Mercer's motivations transcended simple greed or murder. As a member of the Nightingales, Mercer was tasked with guarding a place called The Twilight Sepulcher, the Temple of Nocturnal. According to Gallus, he defiled the temple and betrayed the Thieves Guild. Karliah insists we bring this information to Brynjolf immediately. The following empty quest stages were omitted from the table: 0, 27, 55. On the PC, it is possible to use the console to advance through the quest by entering setstage TG06 stage, where stage is the number of the stage you wish to complete. It is not possible to un-complete (i.e. go back) quest stages, but it is possible to clear all stages of the quest using resetquest TG06. This page was last modified on 14 March 2019, at 08:43.